Shockingly, most people don't even know how easy it is to start making money from the Cost Per Action networks today. We Will Cut to The Chase Here. If You Follow These Simple Steps and Start Experimenting with Cost Per Action marketing, you will unlock a goldmine of potential dollars for yourself with these 25 Video Tutorials. 25 Videos will take you by the hand and show you step-by-step everything you need to know about getting started in Cost Per Action marketing so you can start making money. It's really that simple. We want you to understand something. No one wants to see you wasting your time doing things the wrong way, that is why we offer you this video training series. * A Collection of 25 Professionally Recorded Videos-This complete video series will teach you everything you need to know about working with cost per action marketing, from getting accepted by the networks, to how to promote your offers. * Why You Should Do Cost Per Action Marketing- Before you take one step further, you will want to understand the advantages of CPA marketing, so you can best take advantage of them. * The Top CPA Networks- There are tons of CPA networks out there, This video will share with you the best ones to get started with. * How to Apply and Get Accepted to a CPA Networks- Getting accepted doesn't have to be difficult, you just need to know what to do, and how to present yourself. This video series will help prepare you for your interview. * How to Develop a Positive Relationship with your Affiliate Manager- It is highly recommended that you develop a relationship with your affiliate manager, as this is a person that can help you greatly. This video will show you how to do this effectively. * How to Find a Niche and an Offer- Follow along with as this video will show you how to find the best markets and offers to be targeting. * How to Spy and Get Ideas from your Competition- There is no need to reinvent the wheel, as this video will show you how to spy on your competition, and to help you get your promotions on the right track. * Ways to Market Your CPA Offers- This video will show you seven powerful ways to promote CPA offers. This includes pay per click marketing (PPC), article marketing, twitter marketing, and more. * How to Track Your Statistics- This video will show you how to track your offers, so you can cut your losses when appropriate, and rinse and repeat your winners to make as much money as possible. Since we know it's 100 to your benefit to act right away, We want to sweeten the pot and give you every possible reason to say YES today! Which includes: (1) a Salespage just like this one, (2) a Thank You Page, (3) an Extra Order Page, (4) All the Graphics and Full Master Resale Rights to every bit of this fantastic package. Start learning and making money today. If you are not harnessing the power of internet and affiliate marketing, you are missing out on a literal gold mine. Don't put that kind of power into the hands of your competitors! We could easily charge twice as much for this fantastic product, but we really want to make it affordable to you. Don't delay, as the price may be increased any day. Look at it this way -- $4.77 is really a painless drop in the bucket to be able to get your hands on Cost Per Action Marketing 101 and start using it right away to improve your lifestyle! 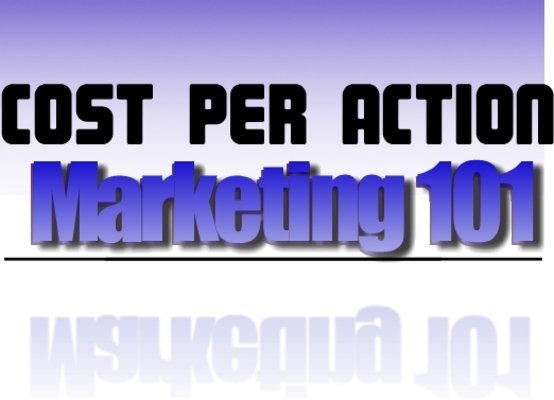 You Really Cant Afford Not To Invest In Cost Per Action Marketing 101 It's easy to get started right away. Just click the order link below. Click here to order right now for only $4.77 (even if its 3:00 am in the morning). Yes! !, I Just Have To Have This Incredible Package! Count Me In Right Now! Remember, there are tons of people out there begging to purchase your product, they just haven't found you yet. To Your CPA Marketing Success!